Back in 2012, Everything Dinosaur reported upon the discovery of a partial nodosaurid footprint found at NASA’s Goddard Space Flight Centre in Greenbelt, Maryland (USA). Subsequent excavations have revealed a diverse trace fossil assemblage, preserving footprints of dinosaurs, mammals and flying reptiles (Pterosauria) located in a single slab of sandstone. This remarkable fossil records a snapshot in deep geological time and shows how different types of animals interacted in a wetland environment. The cast of the track bearing surface reveals over 70 trace fossils. The single slab of iron-rich sandstone measures over two metres in length and the cast of the fossil (see above), represents at least eight different track types denoting dinosaurs, crocodilians, pterosaurs and mammals. All the tracks are preserved as natural impressions (concave epireliefs) and at least twenty-six mammalian tracks have been identified. Analysis of the fossil material suggests that all the impressions were made within a relatively short time of each other, the fossil (GSFC-VP1) can be interpreted as snapshot recording the activities of a diverse biota around a wetland area during the Early Cretaceous (Albian/Aptian faunal stages). Goddard Space Flight Centre (NASA) tracks – schematic drawing. The track that first highlighted the potential of the site “the discovery track”, which is coloured light brown in the drawing above, and situated in the north-eastern corner of the sandstone slab, has been identified as a nodosaurid print. This single print measures around 29 centimetres in diameter. The posterior (heel) region is obscured by a smaller track of uncertain providence. The small track could represent a print made by a juvenile Nodosaur. If this is the case, then this section of the fossil could show the tracks made by an adult and juvenile armoured dinosaur as they walked together (see silhouettes adjacent to the track illustration). A single, black object with a raised ridge is also preserved. This has been interpreted as an individual scute from a nodosaurid. Measuring five centimetres across, the fossil is surrounded by a polygonal pattern consistent with the surrounding integument associated with nodosaurid skin impressions. The unique taphonomy of the Patuxent Formation that is exposed at the Goddard Space Flight Centre and other locations in Maryland has already provided palaeontologists with the beautifully-preserved impression of the rear half of an articulated baby nodosaurid. This dinosaur was named Propanoplosaurus marylandicus by Stanford et al in 2011. (A) photograph of nodosaurid scute and associated polygonal pattern of surrounding integument, (B) simplified outline of polygonal pattern. The large nodosaurid print along with the track made by the left front foot of a Sauropod (see single print outlined in light purple and the silhouette on the schematic), confirms the presence of large dinosaurs in the area. Four parallel trackway patterns made by crow-sized Theropod dinosaurs have been identified. The outermost tracks of the group have been labelled in the schematic T1 and T4. This parallel pattern and the short distance between individual footprints suggest that these small meat-eaters were moving slowly and working together to systematically comb the area for food. Goddard Space Flight Centre (Theropod tracks). The picture above shows drawings of various Theropod tracks, T1 consists of six footprints, whilst T4 is comprised of five individual prints (diagrams A and B). The short stride length indicates very short steps, consistent with the idea that these little meat-eating dinosaurs were carefully scrutinising the area, probably hunting for food. Diagrams C and D represent isolated tracks with toe digits widely separated (divarication) – note the scale bar = 20 cm. The dinosaur tracks might first catch the eye, but the real stars of this Early Cretaceous “dance floor” are the collection of mammalian prints. At least twenty-six mammal tracks have been identified. The largest print, covering around twenty-five square centimetres is the largest mammal footprint ever discovered from the Cretaceous. 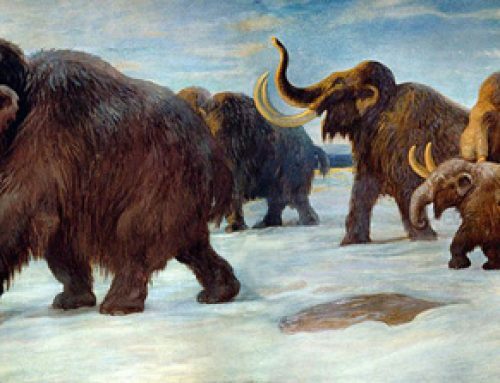 This suggests that there were plenty of mammals about and some of them were quite big, about the size of a Highland terrier or a raccoon. The researchers conclude that most of the mammalian prints represent small squirrel-sized animals and the study has resulted in the erection of a new ichnotaxon Sederipes goddardensis. The genus name roughly translates from the Latin as “sitting foot” as some of these impressions indicate that the small mammals sat up in a similar way to extant prairie dogs. The trivial name honours the Goddard Space Flight Centre. Early Cretaceous mammal tracks (GSFC-VP1). The photograph (above), shows examples of the diverse mammal tracks. Tracks m1-m4 include the holotype ichnofossils of the new ichnotaxon Sederipes goddardensis. Note scale bar and (J) which denotes a large, five-toed track with an image of a similar track described in 2007. The authors believe the wide diversity and number of tracks show many of the animals were in the area actively feeding at the same time. It has been proposed that the mammals may have been feeding on worms and grubs, the small carnivorous Theropods were after the mammals, and the pterosaur tracks found in situ could suggest that flying reptiles were hunting in the vicinity too, perhaps after both the mammals and their reptile contemporaries. The scientific paper: “A Diverse Mammal-dominated, Footprint Assemblage from Wetland Deposits in the Lower Cretaceous of Maryland” by Ray Stanford, Martin G. Lockley, Compton Tucker, Stephen Godfrey and Sheila M. Stanford published in Scientific Reports. GSFC-VP1 cast and schematic drawing.